Helsinki is truly located at the crossroads of Western and Eastern culture and this is reflected everywhere in the green and lively Finnish capital. 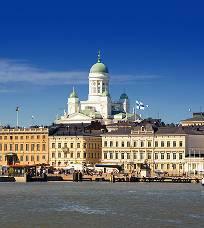 The sightseeing tour takes us around the harbours, up central Mannerheim Street and by the Parliament Building, the Finlandia Hall, and the Sibelius Monument and for a visit at the famous Church-in-the-Rock. The afternoon offers an optional excursion to Seurasaari Open-Air Museum, an oasis in the midst of the city with cottages, farmsteads and manors from all around Finland.